You have to get used to the creeping pace of slow-boil Japanese revenge drama "Harmonium" in order to get on its wavelength. The film follows characters who are, if you distill them to their psychological profiles, not that different from the kinds of people you'd encounter in an Alfred Hitchcock movie or a Patricia Highsmith novel. Polite stranger Yasaka (Tadanobu Asano) disturbs the peace of emotionally unavailable patriarch Toshio (Kanji Furutachi) and flustered but curious wife Akie (Mariko Tsutsui). While there are a handful of moments after the sixty-minute mark that rely on plot twists, tonal shifts, and character-driven plotting, "Harmonium" is consistently about mood more than anything else. You sink into the film at first. Then, with each new leisurely introduced plot point, you struggle to regain your sense of calm since, after a while, the film's protagonists are doing the exact same thing. "Harmonium," the latest film written and directed by Koji Fukada ("Hospitalite," "Sayonara"), largely moves at the speed of everyday routine. Characters go about their daily tasks. Akie oversees daughter Hotaru (Momone Shinokawa) as she practices on her harmonium. Toshio toils in his garage workshop. And Hotaru skips home from a nearby playground. Yasaka, an ex-convict and old acquaintance of Toshio's, is the only main character who has no set routine. His presence throws everybody off, but they eventually get used to him. They talk to him in a matter-of-fact tone for fear that something violent and abrupt will happen if they otherwise treat him like a threat. If they acknowledge that Yatsuka is a threat by changing their habits, then something bad will surely happen. Maybe he'll go away. Maybe he's as tranquil and non-threatening as he seems. Maybe he's not the boogeyman. That uncertainty is the crux of "Harmonium": will Yasaka forgive Toshio of whatever crime or wrong-doing he's committed in the past? Or will Asano's character lash out at Toshio in all the ways we've come to expect from other revenge thrillers: ruin his business, hurt his daughter, and sleep with his wife? Without giving anything away, I will say that "Harmonium" does inevitably go places that you expect it to. And it does not always get there in the most subtle ways. In a key—and immediately jarring scene—Yasaka breaks from his established character, and flat-out says that he wants everything Toshio has. Then Yasaka suddenly regains control of his emotions, and re-assures Toshio that he was only joking. You can't help but groan at this scene. It's like slamming on the brakes during a leisurely drive just so you can point at a giant billboard. We can't miss it, why did you stop? 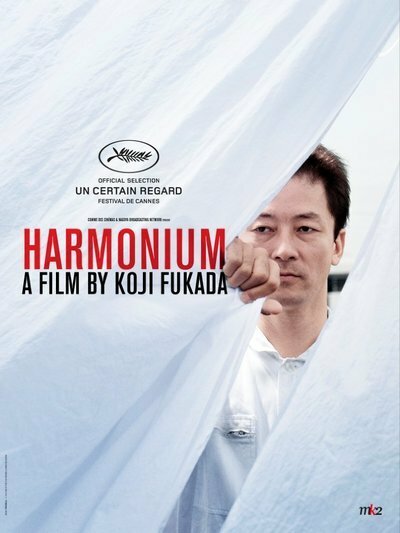 But after a while, it becomes clear that "Harmonium" is, like the best revenge dramas, a movie about the failure of individual characters to regain their composure after tragic events. The second half of the film feels like a separate, but related narrative: everybody recovers after the events of the first hour by inviting a second stranger, Takashi (Taiga) into their midst. But both halves of the film are related in that the first part establishes a certain flow, and the second part shows our characters' vain attempts at regaining that flow. In this way, the second half reminds us of how tentative, or even illusory the first half's mood was. Maybe these characters were never at peace. Maybe there was never a time when they walked on eggshells around each other. Your response to Fukada's latest depends, in that sense, on your ability and desire to get used to its lack of normal rhythm. "Harmonium" is slow, and deceptively tranquil for the most part. Occasionally, there are moments that jar you out of your complacency, and remind you of what's emotionally at stake. The movie functions on an emotional level rather than an intellectual one. If you don't get on its wavelength, you'll feel like you've wasted your time on a movie that is a bit like a slowed-down thriller whose impact has been lessened by the existence of superior novels and films, like "The Talented Mr. Ripley" or "Shadow of a Doubt." But if you treat "Harmonium" like a mood piece, and you do respond to it on that level, you'll find yourself thinking about it long after you watch it.